I get asked a lot about how to start a Montessori-friendly curriculum in the home. What should you be looking for? And can you save money in the process? It can be an overwhelming venture, choosing between so many activities to buy and or make! 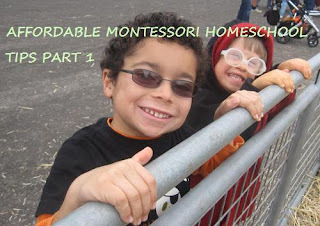 So here are my seven tips for starting Montessori homeschool, affordably. 1. First, don't feel pressured to buy a lot of matching sets of cards you see on Montessori retail websites: you have to laminate them, many children never choose them, or only choose them once and find them boring. Trust me, you will see a lot of them for sale and it will be tempting to buy them because they are inexpensive. 2. Books and puzzles of the same subject are a good bet. For example, in our outside classroom we had insect puzzles that taught the parts of an insect, we then traced the puzzle pieces to make a picture they could color; older children could write the names of the parts of the insect, or cut it out. You can also study real insects with an ant farm and a butterfly garden. Then get books on insects from the library! You can also get geometric puzzles, much less expensive than the Montessori Geometric Cabinet. 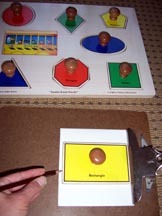 Then, after your child uses the puzzle, you can make cards to match the pieces. 3. For study of the body, mannequins are popular (a body that is a three dimensional puzzle, with parts). You can then make labels for it, and get books and puzzles on the human body. ﻿4. 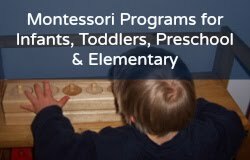 Montessori Math: Every Montessori homeschool should have a Montessori Golden Bead set/sets (made in glass, plastic and or wood), but they are costly. You can, however, substitute with the non-Montessori Base Ten Math Blocks in blue or yellow. The Montessori Color Bead Stairs are great to have, for counting one to nine. And they are less expensive.You can then use the Montessori Color Bead Stairs for simple addition with the Montessori Positive Snake Game and simple subtraction with the Montessori Negative Snake Game. 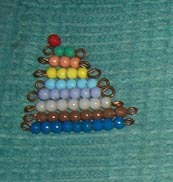 You can also use them for Montessori Teen Beads 11 to 19 (along with nine Montessori Ten Bars. So it is BEST to buy a large set of Montessori Color Beads? Some homeschoolers prefer to make their own Montessori Teen Boards using white poster board and a black marker. 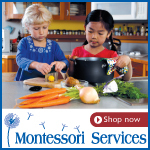 When your child is ready for the Montessori Ten Boards, you can use your Montessori Ten Beads and buy a set of 100 Montessori Unit Beads from The Montessori Outlet (or any Montessori supplier). 5. Science: Kids love to do science experiments. 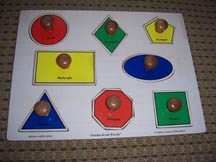 You can do the Montessori preschool science experiments from items around the house. Kids also love the volcano activity. You can make your own or buy one pre made. 6. Creatures and greens: Start with the sensorial. hands-on experience, order earthworms (or dig up your own), a butterfly garden (where you get the caterpillars that make cocoons); catch and grow tadpoles; and plant bean seeds in cotton and watch the roots grow. 7. Bring your own passions to the table! Your love of art, or language, or science, or nature, or music, or crafts. Your child will find their own passions, but if you start with your own interests, it will motivate you to create Montessori activities at home, and have fun with it! Recommended Montessori books for beginning homeschoolers: Basic Montessori: Learning Activities for Under-Fives and Teaching Montessori in the Home the Preschool Years. That's should be enough to get any "Montessori mom" started! Want to pin for later?